Well I have my kit lined up. A Tom Modellbau TKS Polish Tankette. It's not bad considering it's from an Eastern Bloc country in the 90's I believe. Needless to say there are quite a few things that can be seriously improved upon. The gun is horrible. I'll need to replace that with an AM barrel. Any suggestions for an AM 20mm autocannon based on the Oerlikon and a few other guns? The handles too need replacing as they are very thick. I can do that out of wire. This tank is extraordinarily tiny. The tracks are probably only 1/3rd the size of my M4A3E8' T66 tracks. The box is smaller than what the Revell 1/144 Eurofighter and F-14 Tomcats come in. It's also probably as tall as the E8's hull alone without the tracks attached. cool chaps, like your choices. Submisson is currenty in progress. Anyone fammilliar with ribbon making? I tried, but... well, I didn´t like the results. Sorry that I haven´t repied earlier, could go online just via my phone. No problem. I couldn't think of anything better or easier. All I had to do was resize the image. The box art, though, shows a FK-A armed vehicle but the kit's gun is too short. The mantlet also seems wrong then, as well. Excellent. My kit for this by total coincidence arrived yesterday! Total cost including postage £12.99 so well under the £20! Gentlemen, I like your choices. Yust as I hoped we´ll see soething different. Paul, opening the bags is no problem at all. 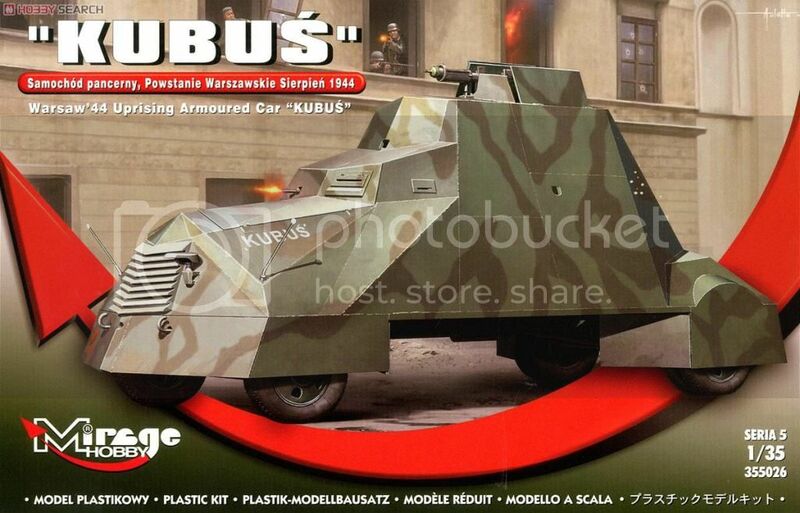 Looking forward seeing the Kubus beeing build. Enlisted! Here's what I'm going with; it just arrived from China today: $20.59 US w/o shipping. No sweet $3 bargains to be had in my area — no hobby shops, no big malls. I've become accustomed to ordering everything online. Well ... shoot ... they still heard cattle down Main Street round these parts! One thing I'd suggest, if possible, is revising the campaign title to 25 Bucks for the win. I got a little confused recently when I reopened the thread. I just picked up a Tamiya 1/48 Crusader MK.III for $18.00 so I'm in. Mike, I used to get okay models at Mizel's off Federal and US 36. They always had old cheap kits stacked in the back along with old Model Railroad buildings. Plus you can stop there on the way back from sending it in Boulder or Eldorado Canyon. Uh-oh! My sinister past has been exposed! Eldo' — haven't climbed there in many years — haven't climbed anything in many years! I live on the other side of the Rockies and Boulder is a 3+ hour drive over the mountain passes for me — not happening in winter or even in summer anymore. I'm in with a bagged ( no box ) Italeri Kubelwagen for $0.99 from Ebay and a eduard P.e. set for $9.99 including shipping . May I use an Academy Priest or HB LWS? You may use any kit, together with any pice of aftermarktet you like. As long as you got them for less than 25$ or 20€ or (if I´ve done the math right:) 65 Real. I'll search the correct price and I'll enlist if I can. @Fabian. Oh, yes, I'm groaning! But I'll live another day... just to see finished that tractor! Hmmm, I've got a whole stack of Tamiya Shermans, bought at a show last year for $10 ea..... and one of their M60 releases, picked up for $18. I gotta look at what's in the works, but I really like the idea of this campaign. As I saw Priests for less than R$ 65,00 (and, yes, your math is very good) I think I'll enlist. @Gabriel: So now we'll have two different variations of TK tankettes. A TKS and a TKS tractor. That's correct, Michael. I'm thinking of painting mine panzergrau (captured vehicle), maybe attaching something to it... I'm still considering what... maybe field made fuel tanks... Any suggestion welcome.